In fall 2015, Grinnell introduced the Spark Tank Innovation Challenge to the College’s weeklong celebration of the Grinnell College Innovator for Social Justice Prize winners and their work in social justice. Loosely modeled after the television show Shark Tank, Spark Tank encourages Grinnell students to think like the next generation of prizewinners by designing their own social innovations to support the local community. Because the contest addresses local issues, Spark Tank seeks insight from experts in the town. For last year’s topic of education, Grinnell-Newburg district educators identified obstacles, coached student teams, and joined Grinnell Prize winners on the judging panel to determine which proposals would receive a share of the $22,500 prize for project funding. Not only does the competition support sustainable community initiatives, it also provides students with the skills, experience, and confidence to begin putting their social justice ideals into practice, at Grinnell and beyond. Among last year’s winners were John Gallagher ’17, Christine Hood ’17, and Liz Nelson ’17. They responded to music teacher Barb Van Ersvelde’s request for language learning opportunities at Davis Elementary School, home to all district third- and fourth-graders. Currently, the district does not offer foreign language instruction until high school. With Van Ersvelde as their coach, Gallagher, Hood, and Nelson developed Lunchtime Language Learners, a program that offers weekly Spanish lessons to Davis Elementary School students. The classes are taught by five pairs of trained College student volunteers. 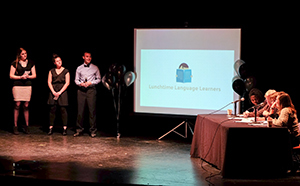 After months of planning and preparation, Lunchtime Language Learners launched its first six-week session of classes in the fall of 2016. Upon entering the classroom — one week the gymnasium, another week the library — the excitement is palpable. The children warm up with a lively game of “Luz Roja y Luz Verde,” then race to their respective corners of the gym. Within moments, they settle into three seated circles. Each mini-class is capped at 14 and led by two College students. While there is no standardized curriculum, all classes employ a high-energy, immersive pedagogy recommended by Claire Moisan, senior lecturer in French and director of the Alternate Language Study Option (ALSO) program. The method is designed to mimic the way language is naturally acquired, making it an ideal approach for teaching young learners. In practice, this looks like a lot of moving, gesturing, singing, and dancing — entirely in Spanish. “PANTALONES!” he shrieks, and the lesson resumes. As fall semester wound down, Gallagher, Hood, and Nelson were already gearing up for their next session of classes, exploring avenues for continued funding and researching innovative ideas for programmatic development. Ultimately, they hope that the success of their program will catalyze other language learning opportunities in the local schools. “Even if it’s not Grinnell College students coming in and helping, even if it’s hiring a full-time district specialist, this program is hopefully going to show them that there’s a need for it and a benefit from it,” Gallagher says. For Lucia Tonachel ’18 and Naomi Worob ’18, the decision to create a resource center at Grinnell High School (GHS) was quite literally a matter of food for thought — the pair discussed it over dinner at Food House. Their coaches, GHS educators Melanie Sharp and Dwight Laidig, are also passionate about ensuring that all students have access to essential resources. Ten years ago, Laidig began stocking his own supply of snacks and other basic necessities for students in need. As word spread, teachers began pitching in, directing students to Laidig or offering resources of their own. With Tonachel and Worob on board, Laidig’s resource drawer has grown into a comprehensive student center. 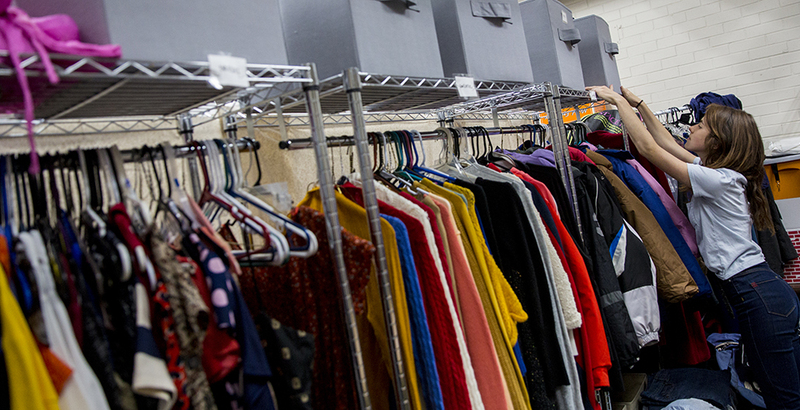 Located within the high school, the center offers food, clothing, hygiene products, and informational resources in a warm, welcoming environment. Before stocking inventory, Tonachel and Worob conducted a survey of GHS students and coordinated with the high school leadership council to ensure that their initiative was responsive to the needs of the community. Clothing, food, and hygiene products are currently sourced through individual donations, clothing drives, and Tiger Packs, a citywide initiative that provides qualifying kids with nutritious food to take home over the weekend. Although the resource center is now its own entity, teachers and other school employees continue to play a central role in connecting students with resources that they may need, but not know of, or feel comfortable accessing. While the resource center has only been open since the start of the 2016–17 school year, Worob and Tonachel are already making plans to ensure its longevity. They have worked with the Center for Careers, Life, and Service to create a permanent service learning work-study position at the resource center, which will help ensure that the College-community partnership lasts long after their graduation. In response to feedback from last year’s participants, the 2016–17 contest features several changes. Most prominently, the timeline is longer: rather than racing to complete the process in six weeks, students had the entire fall semester to develop proposals related to this year’s theme of poverty. They will compete for funding at the pitch contest in April 2017. As part of Grinnell Prize Week, Spark Tank participants and the entire College community were also invited to attend a new series of seminars held by past Grinnell Prize winners. These talks addressed topics such as sustainability, fundraising, and the nuts and bolts of translating social justice ideals into a successful career. In another deviation from last year, this year’s judging panel will select just one winning team, in order to more effectively focus resources for long-term sustainability and growth. Funding for the winning project, as well as a paid service learning work-study position for the winning team, will be provided by the Donald and Winifred Wilson Center for Innovation and Leadership.